Joachim Uhing KG GmbH & Co., internationally known for the rolling ring drive invented by the company founder, has expanded its product range. The Magnet Clip, a magnetic core moulded in plastic, was launched in May 2012. It adds to the series of tensioning and clamping elements Uhing developed for application on plain shafts. “In our company, we often refer to our new clamping system as the ‘quick sibling’ of our tried and tested U-Clip,” explains Wolfgang Weber, Uhing’s Managing Marketing Director. 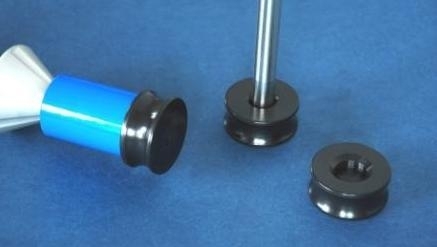 The new product offered by the company based in Schleswig-Holstein is used to fasten spools, rollers, cover parts etc. on steel shafts or steel pins. It is a synonym for highly convenient working with plain shafts because it ensures a secure seat and prevents slipping off the shaft. As can be expected from Uhing products, the Magnet Clip is also very user friendly. Even the Uhing® U-Clip that fastens with only a few twists impresses by particularly easy handling: pushed against the part to secure like a sleeve, it engages on the shaft with a clamping disc and develops high retaining forces. To remove it from the shaft, simply pull it off at the clamping disc. Clip is even more convenient: push it over the face of a shaft on which to fasten an element. As soon as it is close to the shaft, it snaps into the right position almost automatically and secures the spool or reel. When no longer needed, you can quickly remove it from the shaft with a short, powerful movement of your hand. How does fastening occur? Choose the length of the free shaft journal so that contact with the spool or roller as well as a certain retaining force are ensured. When elements of different width need to be fastened, the length of the shaft journal must match the widest of the elements to fasten. The distance between Magnet Clip and shaft face can be adapted to less wide reels with tubular spacers. The retaining force is relative to the distance between Magnet Clip and the shaft face. For a shaft of 20 mm diameter, the retaining force ranges between 70 N at a distance of 0 mm and 20 N at a distance of 5.0 mm. For a shaft of 10 mm diameter, the retaining force ranges between 40 N at a distance of 0 mm and 5 N at a distance of 3.5 mm. special diameters upon customer request. Uhing® Magnet Clip is used with untempered or tempered shafts of fit tolerance h11. The Clip also allows for larger shaft tolerances and is fully rotationally symmetrical. “Uhing Magnet Clip fastens many things – from label reels, rollers and spools up to food industry products. The closed design of the Magnetic Clip makes it easy to clean, a major benefit for foodstuff applications,” points out Wolfgang Weber. Magnet Clip is not only attractive due to its magnetic core, but also its low price. Once again, Uhing has proved it: products offering a high quality, a great savings potential and convenience for their intended application need not be expensive at all.